You are cordially invited to the 18th Annual Memorial for Kim Marie Groves and Families of People lost to law enforcement excessive force. In 1994, my mother was brutally and senselessly murdered for speaking out against police corruption, but I know she is one of many others who have not seen the justice as my family has. Len Davis is on death row, but how many other families never got their day in court or even an explanation of what happened to their deceased loved one? We all deserve better and I believe we have the power to win better treatment for ourselves, our loved ones and our entire community. 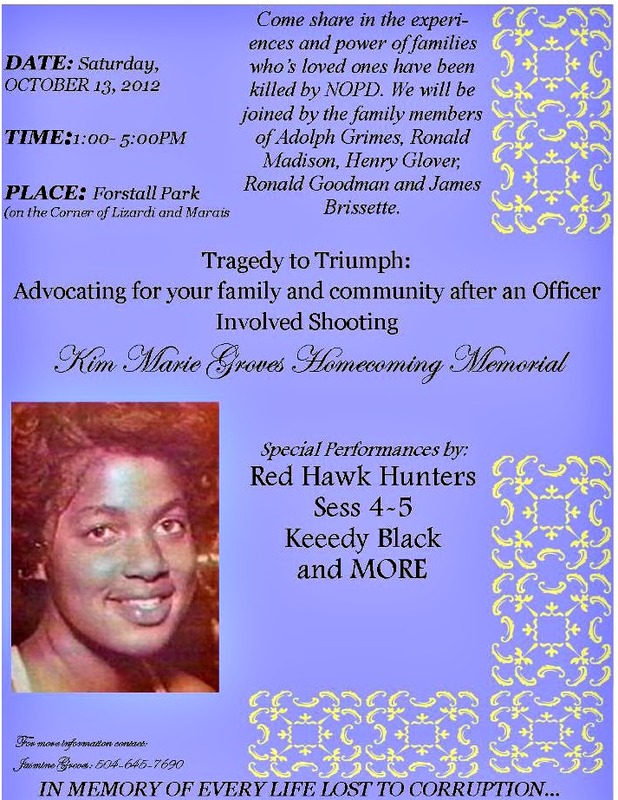 Every year, I hold a public memorial to honor my deceased mother, Kim Marie Groves, on the date of her death. My relationship with the Independent Police Monitor has inspired me to expand that memorial to remember the hosts of others lost. Also, I think we can do more than just remember our loved ones. We can change the rules of the game so that others won't have to suffer as we have. Join us at Forstall Park (on the corner of Lizardi and Marais) on Saturday October 13th from 1:00- 5:00 PM. We will enjoy performances from local artist and the Red Hawk Hunters as well as hear from the family members of people like Henry Glover, Ronald Madison, and Adolph Grimes. Come out and Remember our lost loved ones, Celebrate their lives and Empower ourselves to build a safer, stronger community. A flyer is attached. If you have any questions, please call me at 504-645-7690. Thank you in advance for your leadership and support.